Olga Celeste on set with Neissa. Photo courtesy of Click magazine, 1938. 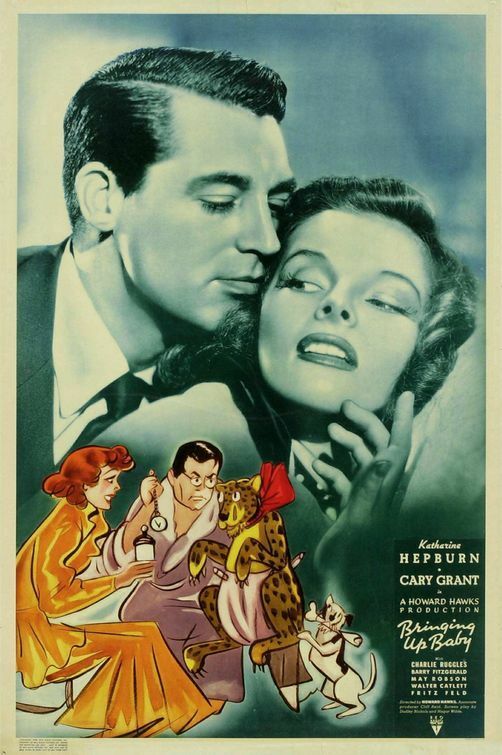 Seventy-eight February’s ago (that’s 1938, if you struggle with math) Katharine Hepburn and Cary Grant were lighting up the silver screen with funny situations in their second movie together, Bringing Up Baby. 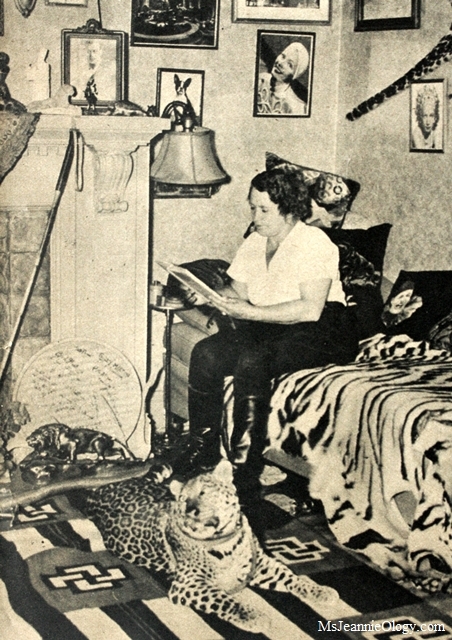 Olga Celeste and her leopard Neissa. Photo courtesy of Click Magazine, February 1938. 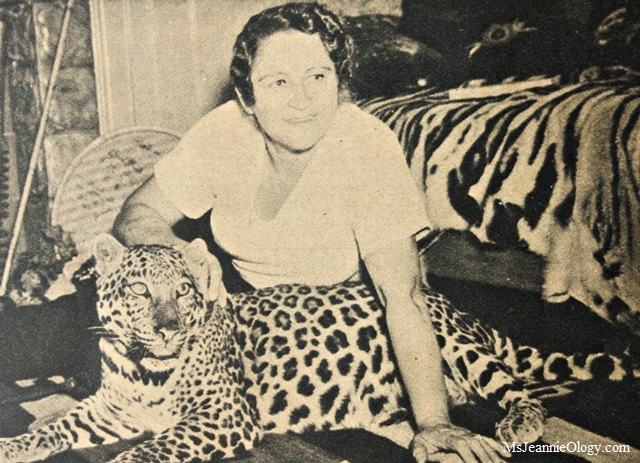 Meet Olga Celeste, an early Hollywood animal trainer and her favorite Indian leopard Neissa. Olga was born in Sweden in the late 1880’s and began working with animals at the age of 11. 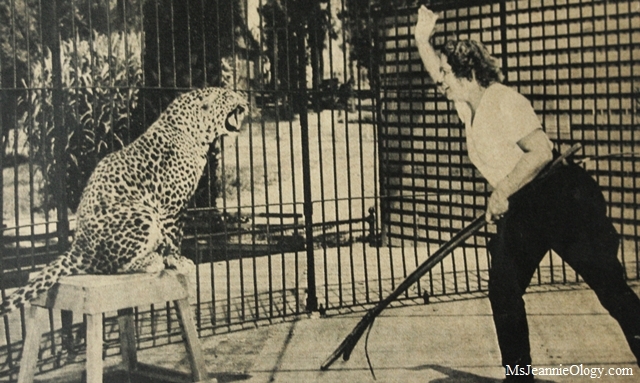 By 1938, she had taken her talent all the way to Burbank, California where she held court as the only female leopard trainer in the world. Ms. Jeannie loves this photo below – you can see Olga’s excitement in working with her students. Part of the Vaudeville circuit, she was also an actress and stunt double but her true passion lied in leopards. Using the art of conversation, rather than physical brut power, Olga trained her leopards by talking to them, using the power of her confident personality to gain control of the cats instead of using fear tactics and force. 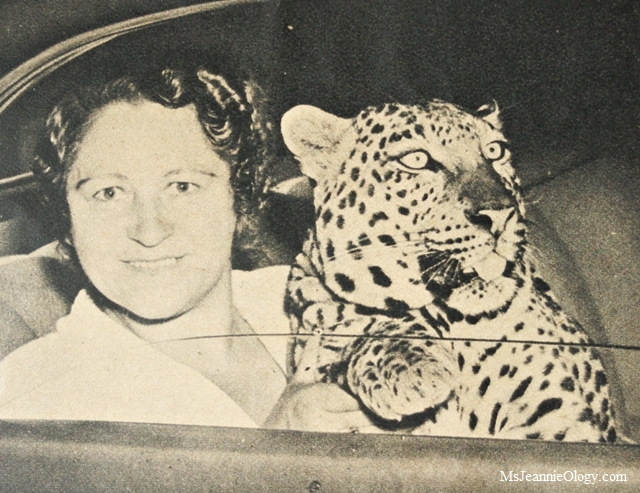 Employed by the Luna Park Zoo in Los Angeles, Olga worked with and trained a handful of leopards but her favorite was Neissa, whom she considered nothing more than a large house cat. Because Neissa was such a joy to have around, Olga often took her home with her after a long day on the set. Like any person passionate about their profession, Olga’s home reflected her life with leopards in both the decor and the wall art, which was made up of signed photographs of all the actors she had worked with in Hollywood. At home with Neissa. Photo courtesy of Click Magazine, February 1938. Sweet and docile for the most part Neissa did have a precocious side. As a lover of perfume (like all pretty ladies!) Neissa was soothed, comforted and drawn to anything that smelled fragrant, so Olga used perfume as her main training technique. 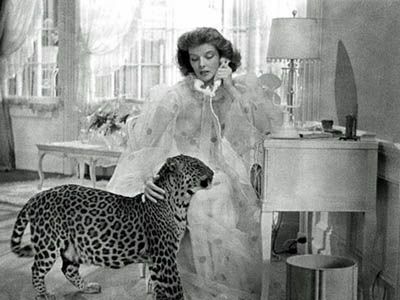 In Bringing Up Baby, the very first scene shot for the movie featured Katharine Hepburn walking around her bedroom and talking on the phone wearing a gorgeous floating dressing gown. True professionals…Neissa and Katharine in action. Perfume was sprinkled on the cloth near Katharine’s knee so that Neissa in the scene would rub up against Katharine’s leg in affectionate greeting. Neissa’s character, Baby, was portrayed as a sweet and affectionate cat with a touch of wild precociousness. Like her real-life self, Neissa was also sweet and affectionate and wildly precocious. 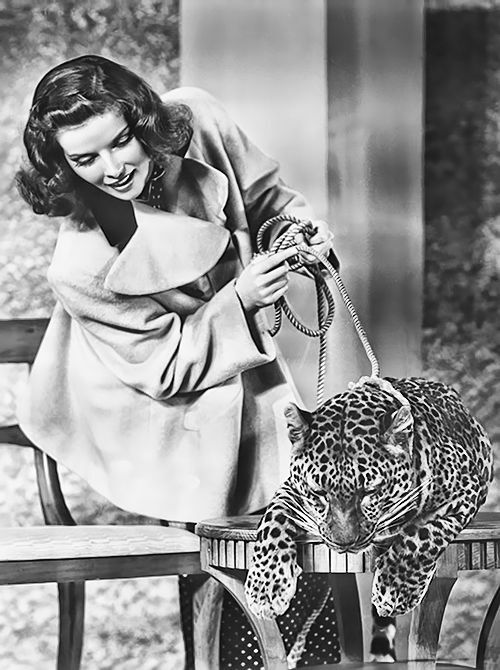 Promotional still for Bringing Up Baby featuring Katharine and Neissa. Katharine worked with Neissa at ease up until the point the innocent clinking of wardrobe weights on one particular skirt irritated Neissa so much so that she spontaneously lunged for Katharine’s hemline. Luckily Olga stepped in at just the right moment before anything unfortunate happened but it did cause fearless Kate to readjust her casual relationship with Neissa. Olga, always quick on her feet had the strength and ability to lift up to 200 pounds, so she was capable of protecting all actors on-set should something go awry but Cary Grant wasn’t reassured by Olga’s presence just off-camera. He was so terrified of Neissa that the director Howard Hawkes had to come up with creative shots so that Cary and Neissa never actually acted together in any one scene. This was one of the scenes that had to be patched together so that Neissa and Cary Grant didn’t have to be in the car at the same time together. Olga understood that leopards weren’t for everyone but hoped through training demonstrations and film performances that people would come to understand how truly intelligent and extraordinary these exotic creatures were. Working well into her 60’s, Olga’s last film with her leopards was the 1950’s blockbuster The Ten Commandments, but a lover never truly stops loving, so she continued to stay engaged, interested and informed with all matters animal throughout her retirement. After more than seven decades in the film and animal training industries, Olga passed away at the age of 81 in Burbank. Olga and Neissa, pals for life. 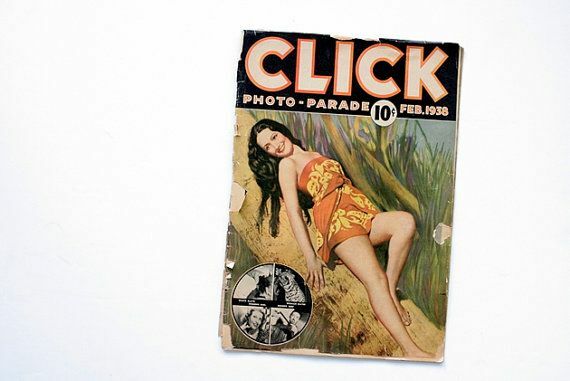 Photo courtesy of Click Magazine. February 1938. Olga is a fantastic role model for the month of February… this follow-your-heart time of year that is synonymous with love, passion, romance and taking chances. Olga made a lifetime career out of pursuing her interests, living fearlessly and having fun in the process. She fell in love with leopards at a young age and managed to stretch that interest across two continents, eight decades, one wild kingdom and millions of people. Although initially under-appreciated, Bringing Up Baby is now regarded as one of the best comedic movies of all-time and consistently lands on the ten best list of Katharine Hepburn’s greatest performances. If there was never an Olga, there would never have been a Neissa. And if there was never a Neissa there might never have been a comfortable Kate and if there was never a comfortable Kate there would never have been a successfully comedic Baby. And if there was never a Baby there would be a few less laughs in the world. And the thought of that dear readers is an absolute tragedy. Cheers to Olga and to living life with a heart full of love! So glad you enjoyed! Thank you so much for reading and commenting my dear!